A Web API is used to provide data connectivity between the database and the front-end application. On the UI side, I will use the Angular Material theme to create a rich, interactive, and device-independent user experience. You can read my previous articles related to Angular 7 from the following links. Create a database. 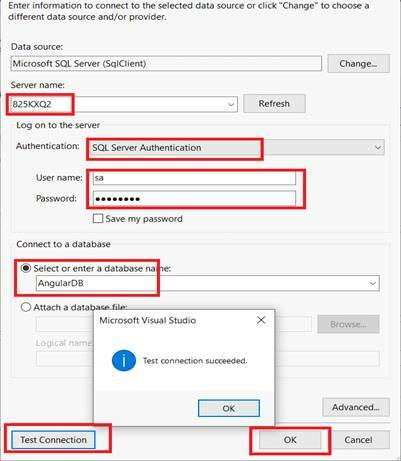 Open SQL Server and create a new database table. As you can see from the following image, I create a database table called UserDetails with 7 columns. 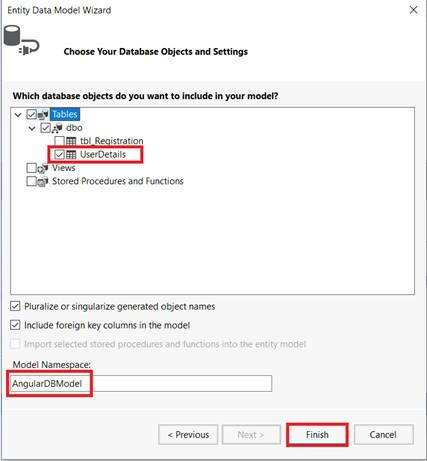 Note: If you already have an existing database and table, you can skip this step. Now, we will create a Web API with the functionality of bind records from the database. Go to Visual Studio >> File >> New >> Project >> Web Application. After that, click OK and you will see the templates. 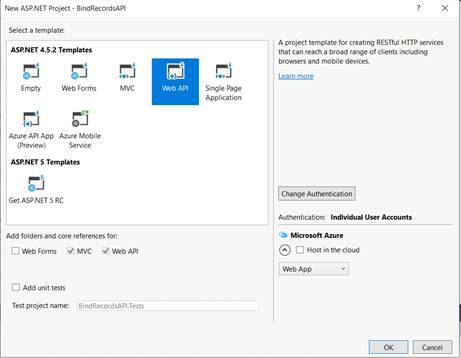 Select the Web API template. Now, select the Models folder. Right-click on Add >> New Item. 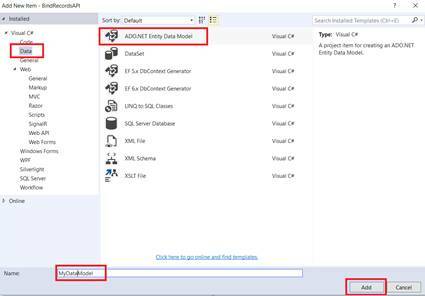 Select Data in the left panel and choose ADO.NET Entity Data Model. Now, click the "Add" button and select EF Designer from the database and click Next. After that, give your SQL credentials and select the database where you have your database table and data. Click the "Add" button and select your table and click on the "Finish" button. Now, we will write code to perform the binding operation. 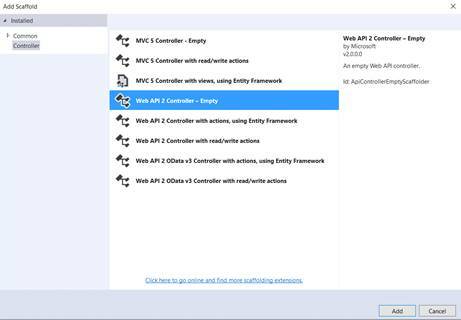 Go to the Controllers folder in our API Application and right-click >> Add >> Controller >> Select Web API 2 Controller-Empty. Now, we will go to the controller class and set the routing to make it more user-friendly by writing the below code. As you may see from the above code, it has functionality bindrecords to the table. 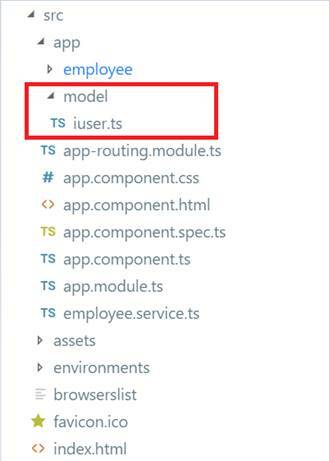 Now, we will create the Web application in Angular 7 that will consume Web API. First, we have to make sure that we have Angular CLI installed. Now, open Visual Studio Code and create a project. Open TERMINAL in Visual Studio Code and type the following syntax to create a new project. We name it BindRecords. After that, hit ENTER. It will take a while to create the project. Once created, the project should look like this. Now, we will create components to provide the UI. I'm going to create a new component, Employee. Now, write the following command that will create a component. You can use see the component is created. Now, we create an interface like model class. Now, write all properties of the Employee class related to an employee that matches with the database. Now, we will create a service. Press ENTER and you will see service files. 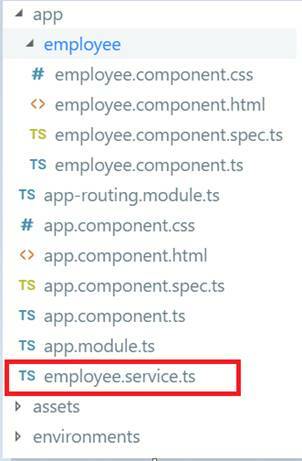 Now, open employee.service.ts and first import necessary class and libraries and then make calls to the WebAPI methods. As I said earlier, we will use Angular Material theme to create a rich, interactive and device-oriented UI for our Web app. 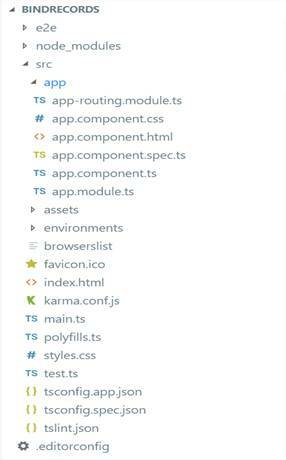 Let's install the Angular Material theme. 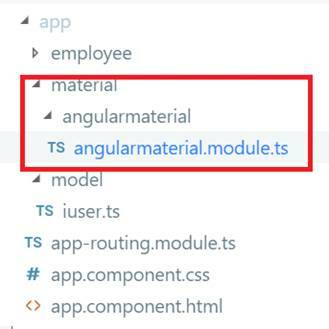 If you want to learn more about Angular Material, visit here: link. After installed successfully, we can check in the package.json file. Before the use of Angular Material, we need to add the necessary library. Here, we will create a separate module for adding the library. Open TERMINAL again and write the below command. Open angularmaterial.ts class and write the below code. Now, open app.module.ts class and write the below code. We have added the necessary library . Now, we will design ui using angular material table. 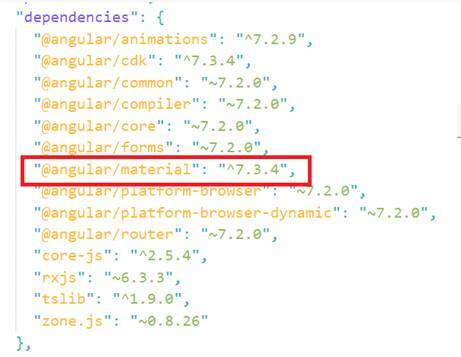 Let us first understand how it uses angular material line by line. Begin by adding the <table mat-table> component to your template and passing in data. The simplest way to provide data to the table is by passing a data array to the table's dataSource input. The table will take the array and render a row for each object in the data array. Since the table optimizes for performance, it will not automatically check for changes to the data array. Instead, when objects are added, removed, or moved on the data array, you can trigger an update to the table's rendered rows by calling its renderRows()method. The set of columns defined represent the columns that are available to be rendered. The specific columns rendered in a given row, and their order, are specified on the row. To paginate the table's data, add a <mat-paginator> after the table. Angular Material does not provide a specific component to be used for filtering the MatTable since there is no single common approach to adding a filter UI to table data. A general strategy is to add an input where users can type in a filter string and listen to this input to change what data is offered from the data source to the table. Now we will write code for perform the bind records, filtration, pagination and shorting functionality. 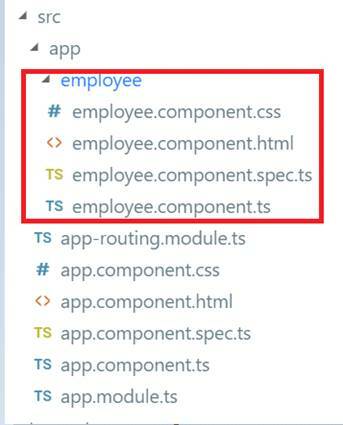 Open employee.component.ts file and below code. Open employee.component.html file and write below code. Now we have completed all code functionality now we will run the out project but before that we set cors because If you consume the Web API, Angular blocks the URL and we called this issue CORS(Cross OriginResource Sharing). First, let's resolve this problem. Go to the Web API project. Download a Nuget package for CORS. Go to NuGet Package Manager and download the following file. After that, go to App_Start folder in Web API project and open WebApiConfig.cs class. Here, modify the Register method with the below code. We have completed all needed code functionality for our functiolity. Before running the application, first make sure to save your work. Now, let's run the app and see how it works. Open TERMINAL and write the following command to run the program. The output looks like the following image. It's a stunning UI that's created. We've finished performing bind records, pagination, sorting and filtration in an Angular 7 using Web API functionality. 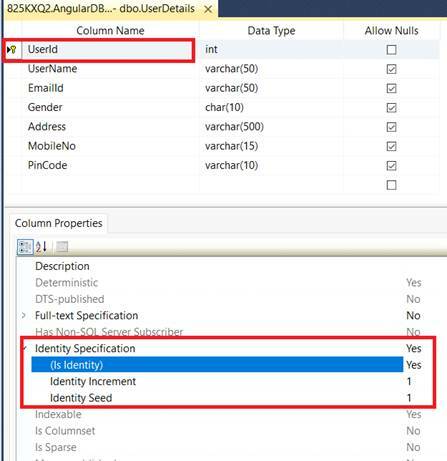 The app uses a Web API to provide data access from SQL Server.